Knitting pretty: Kate Winslet looks peachy keen in the new St. John Spring 2012 ad campaign. Though we wouldn't hold our breath for Titanic: Part Two, Kate Winslet does have one sequel worth getting excited about. 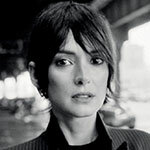 After teasing us with a behind-the-scenes preview, the British actress is back as the face of St. John with a new Spring 2012 ad campaign that offers a softer, yet just as scintillating take on her cinema-set Fall 2011 shoot. Shot by Craig McDean in a New York City penthouse, the gorgeous ads see the natural beauty proponent once again playing up her actress role off-stage as she pores over scripts in a slouchy peach sweater worn with a white maxi, plus a silky dark gray wrap dress paired with a python clutch and a flash of thigh. "This collection does feel very light and very fresh," the Lancôme ambassador says in a behind-the-scenes film as she models ivory knits and a slinky peach gown. "What I love too is the lines are a lot more relaxed, and yet at the same time they still give shape, so you get those lovely feminine curves, which to me are very, very important." The Oscar winner, who singles out a soft white jacket paired with gray trousers as her favorite pieces in the collection, also praises the label's universally flattering cuts. At ease: Winslet shows off St. John's more relaxed spring collection. "You don't have to be a size 2 or even a size 4 to be able to wear these garments because they fall so well, they're cut for women with a shape, and of course I love that," she says. "That's me all over."